A novel works like a photograph. Things happen in a past-present that retreats from view. The periphery is easier to notice than the center; the moment is in view, the past is not past. It’s the world of Kafka, in fact, which seems puzzling because he appears to invite the reader to “assume high-powered symbolic and allegorical meanings” to it, and at the same time repel such assumptions. 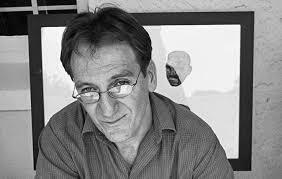 “Yet when the narratives are examined, it discloses more than what it literally means.” And it is also the world of Ivan Vladislavić, where the land lies open like a book and it is impossible to “ever do justice to something so rich in detail.” At the heart of any quintessential novel is a form of implacability, a double negative, a stream of sub-plots that cancel themselves out, the irony of an irony. Pages out of the book. The world Vladislavić makes is true to its ethics of perception. Enabled by history, which at the fall of apartheid “steps down from its pedestal to meet you in the street,” it is an an account of a “peculiar passivity”, used in the novel in reference to Saul Auerbach, the famous photographer whose way of seeing gives the novel its ethical pulse. What kind of ethics? Toward the end of the novel, the narrator Neville Lister, who in his youth was instructed by his Dad to spend a day with Auerbach, is said to be a man of his times, “disaffected but not disengaged.” In this book, the photographer’s lot is charted in many ways. But a disaffected engagement is peculiar; it asks you to waltz through time without being swallowed by it. In other words, to possess a peculiar passivity. Photography, in a sense, like a timestamp, bears the fate of history. If you want to talk about the past, in a present continuous tense, you would have to hold up a photograph. What you are assured, however, is not that you can outride every historical storm. You cannot learn from a photograph what you ought to do at an instant moment. Neville knows this: “History would break me over like a wave that had already swept through the manor house and bear me off in a jumble of picture frames and paper plates.” The question that presents itself time and again in Vladislavić’s novel is the value of a photograph. A photographic object, in time, is replaced by newer photographic objects. The riddle of the photograph, and the task of the photographer, begins with acknowledging obsolescence. Auerbach is not deceived. He knows his worth will not be decided by the reception of his photographs by the world. “I’m not trying to demonstrate a proposition or substantiate a claim. I’m just looking for what chimes. Let’s say there’s a disequilibrium in me, my scales are out of kilter, and something out there, along these streets, can right the balance. The photograph – or is it photographing? – restores balance.” To balance is to render adequate, but you never get to the point where all balances are righted. This is why this book reads, in part, like a coming of age story in which Neville Lister never came of age. Its chronology is basic, but the spaces between one phase of the narrator’s life and the next are heavy with the strides of photography’s big ontological questions, photography’s disequilibrium. And this is the only way in which his disequilibrium would make any sense. Photographs deal with gaps in the known world. They seek out a balance between what is visible and what is not. The difficulty is that the camera approaches the visible as though it is all that there is. But the photographer knows that there are fractioned moments that cannot be captured by the camera—it doesn’t matter how powerful the camera as an apparatus gets, the photograph will remain “flimsy” in relation to the world. My ambition is to find a way to understand a photograph as I understand a novel, and to berate this flimsiness. Perhaps the world of the photograph stands apart from the known world. The gap that opens up between the photographer and the known world is what is captured in the photograph. It is similar to what happens in a novel. The novelist is at work to capture the vibrations within the gaps of the world. A great novel will not necessarily conform to the inferential laws of the known world. It will work based on its own laws. Every photograph works based on its own inferential law: the moment determined by the photographer when it must come to being. Neville, who was present when Auerbach took a photograph, reports that, “He waited for something to happen. Or not happen. Something imperceptible to the rest of us had to become clear before he could release the shutter.” When he released the shutter, Neville says it “fell through the moment like a guillotine,” creating a decisive moment, and hence inferring its own existence. The truth is ample in its evidence. To be true to its calling, a novel about apartheid would be founded on the ritual of photography. Images, of any kind, have no importance as useful surfaces if they have no political referents. Vladislavić’s genius lies in how he took Neville’s trouble with the political history of his country and imposed it on his trouble with the magical universe of photographs. This antinomian pair of trouble is a double negative—the contradiction in photography cancels off the contradictions in politics, but we always come back to the same ironic and incestuous relationship between them. Pages out of the first edition with photos of David Goldblatt. 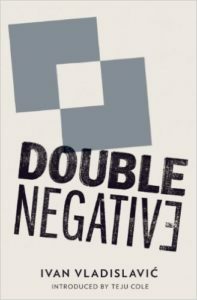 If I wanted to conjure a meaning, I would say that Double Negative is the riddle Vladislavić offers to express the inauthenticity of his post-apartheid message. It’s a strange account of the dead letters from the past, which are freighted into the present not to provide any form of illumination (or consolation), but to always refer us to the circumstances in which they were written in the first place—the letters are “disaffected, but not disengaged.” Novels today offer too many illuminations, consolations, and disengagements. In this way they are closer to selfies than experimental photographs. It is deeply idealistic to think that the eye cannot flinch. If you work in Africa you know that there’s a hurricane of change. The population under thirty is over seventy percent, and the notorious consequence of this fact is evident in urbanism, technology, and the economy. Honesty is reacting to this with trembling hand but a steady eye. Irony is present in the thought that a trembling hand would mean a flinching eye. But freedom, always an ideal, will make a trembling hand into an unflinching eye. The trembling hand is a thick metaphor for apparatuses, like cameras, that are programmed to make the photographer subservient to it. It is also a metaphor for the changing realities of everyday life in Africa. All of Vladislavić’s tangential imperative in Double Negative can be taken as an articulation of a philosophy of photography. But the subject of photography in the novel, resorting to a factual analysis, is not tangential, but the axle on which it turns. 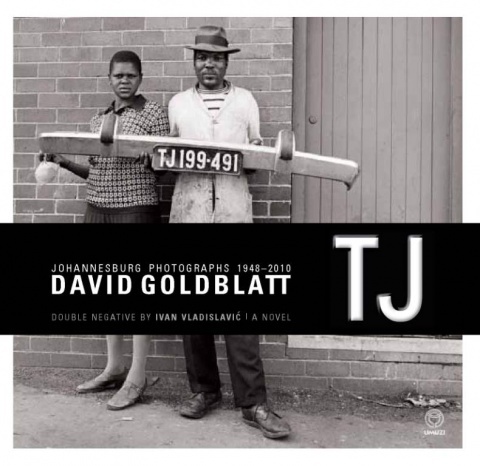 It was written in conversation with David Goldblatt’s photographs of Johannesburg beginning in the early 1960s, and first published together with TJ, Goldblatt’s 2011 photo book. Neville is like many photographers today who are constantly questioning the task of photography in a world saturated with images. Thankfully, Auerbach – Goldblatt? – Is the ethical pulse of the novel, pointing to freedom? Brief bio: Emmanuel Iduma trained as a lawyer in Nigeria. He is the author of Farad, a novel.